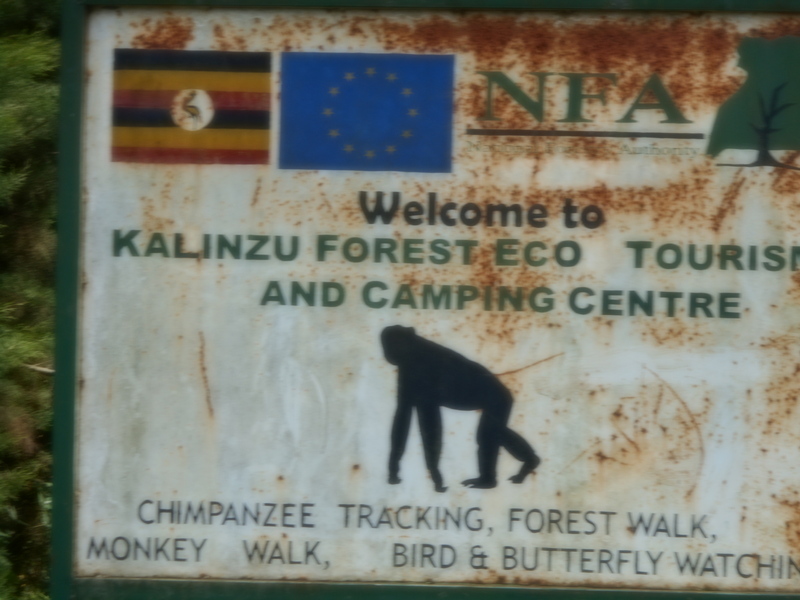 Kalinzu Forest, Uganda. We went to see chimpanzees in a forest that was home to a group of 40 chimps. We found the sign by the side of the road and drove on the path beyond. At the office, we were lined up and given a briefing. Then we set off with our guides. It was a hot but I was pleased as I knew I otherwise would not be rambling around such thick jungle. Would we see chimps? After penetrating the muddy, green moss surroundings for some time between two and three hours, we found a tree of chimps, four males and one female. I could observe no discernable difference between the males and the female. The guide said that females with newborns were keeping away from the males so the males wouldn’t kill their babies. From what I had read in Jane Goodall’s Through a Window, I was hoping they were keeping their babies safe from the other chimp mothers too. In the tree were haphazard piles of dried leaves. The guide took some time to draw our attention to certain piles. He said these piles, where branches intersected with the trunk, had been their nests or beds for the night before. We were told each chimp makes a new bed each night. It was fairly early in the morning and it didn’t seem like they had moved far from their beds. They all seemed to be lounging where they could observe us. To me, it seemed the chimps were intent on finishing their morning grooming, whether or not we watched. 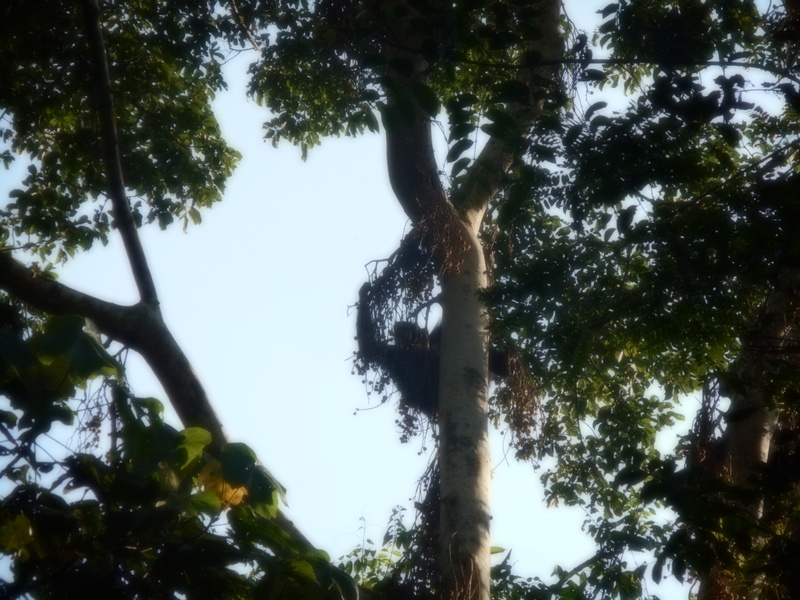 The guide said the chimpanzees would stay in this tree until they finished eating its fruit (figs). In what looked like a comfortable sprawl, the chimps would reach over and use their hand to pick a fig growing on the branches and bring it to their mouths so they could take a bite, just like anybody would. 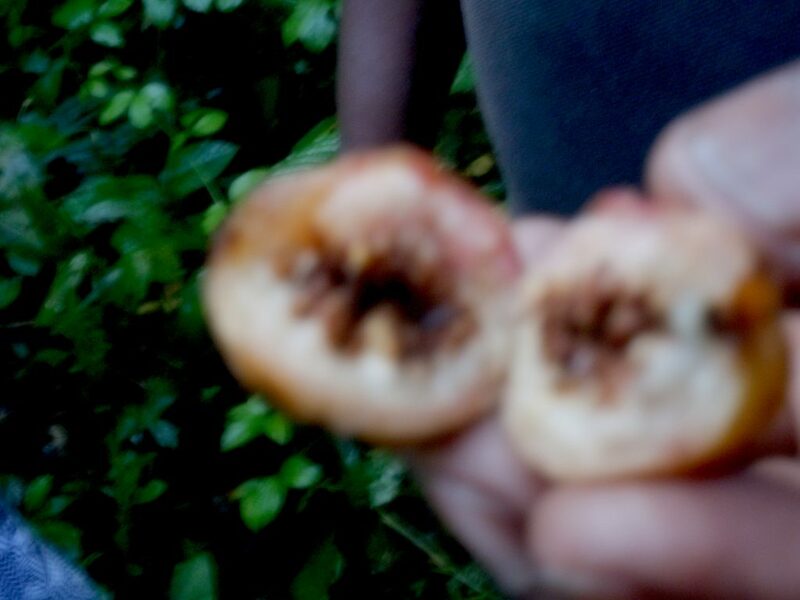 They seemed to carefully chew the figs and then after chewing on a few, would spit a wad of chewed fig pulp. I picked up one of these wads to investigate; it was dry yet spongy. People spitting tobacco came to mind. The chimps would nonchalantly eat and not move much about the tree unless the fig locations required that they reposition themselves. And they seemed to be indifferent about positioning themselves upwards, downwards or sideways. 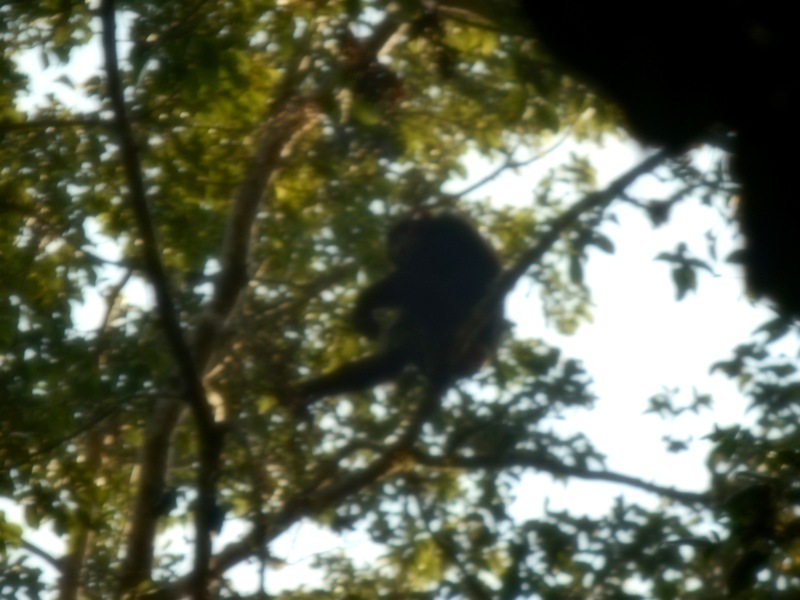 The guide pointed out one of the chimps as being the alpha male. As we watched, we could observe that the others made way when the alpha male moved toward any particular branch. Other than that, they didn’t seem to pay much attention to each other. The chimps were very aware we humans were there and acted unconcerned about it. Sometimes, I would think a chimp was looking thoughtful in a gaze in our direction, but I may have been reading too much into it. Were we inhibiting their movement and banter? We were milling around their tree. Just when you had the perfect view, the chimps would shift in the leaves so that you needed to find a new location from which to observe. While we were only about twenty to twenty-five feet away, we were in a dark forest and they were amongst leafy branches that reached into a sunny sky. Photography was challenging. In getting ready to depart, I just barely avoided taking a shower; one of the males urinated so that a two-minute cascade poured down. Was that intentional? Had the chimps filed complaints with the Jungle Council about human intruders? The green forest in which this Tree of Chimps stood had many big millipedes, long skinny black worms and large spiders; these were all obviously visible. Were those warning signs? The human guides were very friendly.